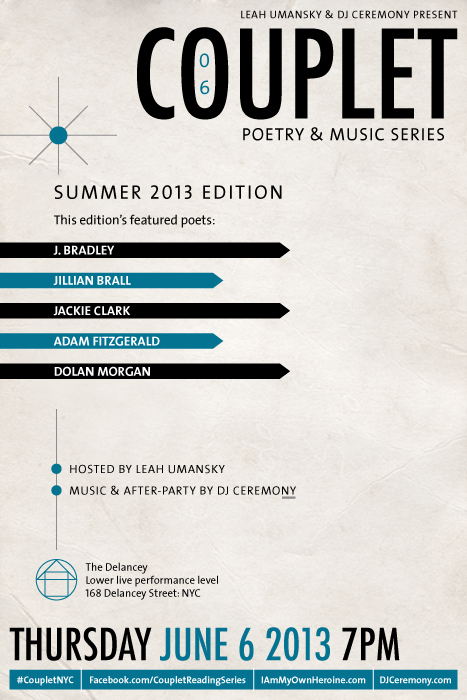 “COUPLET”—A Poetry and Music Series at The Delancey, LES. Quarterly. Summer 2013 Edition: Thursday, June 6, 2013. Hosted by poet Leah Umansky, Couplet is a quarterly reading series held on the Lower East Side featuring both emerging and established poets. Every event features music & after-party by DJ Ceremony. Jillian Brall is co-editor of the poetry journal, Lyre Lyre, and co-curates the Earshot reading series. Her poems have appeared in journals such as Ragazine, Esque, Connotation Press, Ping Pong Magazine, Unshod Quills, and others. She is also a visual artist. Jackie Clark is the series editor of Poets off Poetry and Song of the Week for Coldfront Magazine. She is the recipient of a 2012 New Jersey State Council on the Arts Fellowship in Poetry and is the author of three chapbooks: Office Work (Greying Ghost Press), Red Fortress (H_NGM_N), and I Live Here Now (Lame House Press). Jackie lives in Jersey City and can be found online at nohelpforthat.com. Her first book, Aphoria, was recently published by Brooklyn Arts Press. Adam Fitzgerald is the founding editor of the poetry journal Maggy, and teaches at Rutgers University and The New School. His poems have appeared or are forthcoming in A Public Space, Boston Review, The Brooklyn Rail, Conjunctions, Fence and elsewhere. His first book of poems, The Late Parade, is forthcoming from W. W. Norton’s Liveright imprint in June. He lives in the East Village. Dolan Morgan lives and writes in Greenpoint, Brooklyn, where he is an editor at The Atlas Review. His work can be found in The Believer, Field, Pank, The Lifted Brow, Red Lightbulbs, Armchair/Shotgun, The Collagist and elsewhere.